It may be still be awhile before Jenrry Mejia appears in uniform again for the Mets but at least we now have an idea of which one. Programs distributed at Citifield this week (but not the roster at Mets.com incidentally) list the disabled lefty reliever as having taken No. 58 — this after seeing his previous No. 32 issued to newcomer LaTroy Hawkins. The online roster still lists Mejia wearing 32. It’s probably for the best suiting Mejia up in a rookieish garb again while we try to forget the bumbling early months of his career and the inevitable recriminations that followed his surgery. It was also a nice gesture on behalf of the 40-year-old veteran Hawkins, who according to Baseball Reference has worn 32 for the Twins, Cubs, Giants, Orioles, Rockies, Brewers and Angels over the course of his 19-year career. He’s also settled for short stints in 23 (in Baltimore); 22 (with the Yankees and Astros) and 21 (Yankees). Thanks to Jason E for the tip! Leave it Yankee fans to find a way to interrupt my schafenfreude. After the Mets were rained out last night, I listened in with sick delight as the Rays dismantled the Yankees, 13-4. The beatdown was highlighted by a 6-run outburst against LaTroy Hawkins, the newly acquired veteran reliever off to a rotten start with the Yankees. 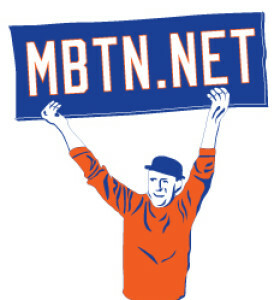 There’s not a true Met fan out there who didn’t chuckle to themselves when the Yanks made that acquisition, by the way. Hawkins was the pitcher who surrendered a 3-run, 9th-inning, game-tying bomb to Victor Diaz in the final week of the 2004 season, in a game that ultimately obliterated the Cubs’ run for the playoffs and provided about the only Mets’ highlight of that entire miserable year. But back to last night. Yankee fans being Yankee fans, it’s not enough for them to be disgusted with, and unsupportive of, their players while they struggle. No, they have to hate Hawkins on a level beyond that for having the temerity to struggle while wearing (hush now) Paul O’Neill’s venerated No. 21. So while Hawkins was out there scuffling last night, he did so to a chorus of unsportsmanlike “Paul O’Neill!” chants. Mets fans, don’t act like that. Never mind the fact that Hawkins explained he’s wearing the number in honor of Roberto Clemente. That in itself ought to be reason enough to leave his choice alone. But somehow the Yankees and their fans have allowed the whole idea of re-issuing popular players’ numbers to become an affront to the former player’s dignity and an invitation to their fans to act disgracefully. The Yankees’ organizational habit of dubiously retiring numbers (Howard, Maris, and Jackson to name three) no doubt has conditioned fans to sniff out disrepect behind innocunous or even well-intentioned re-issues, while demanding they honor any or every pretty good but not great player who came through the organization and was fortunate enough to be a part of a championship team. 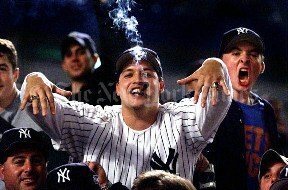 DISCLAIMER: Not all Yankee fans are like the guy above. Many don’t smoke. * The Mets’ rain-out last night sets up a delicious Santana-Glavine matchup for Sunday’s game, which we’ll be watching at Stout NYC (133 W. 33rd St.) for the Mets by the Numbers launch/viewing party. I’m told SNY’s Mets Weekly crew may be on hand. Hope to see you there too! * I’ll be warming up for that event with a talk and book signing today (Saturday) at Barnes & Noble in Bayside, 3 p.m.